Can you plant St. Augustine with Centipede grass? Can St. Augustine Grass Grow in the Shade? Can St. Augustine Grass Have Above Ground Runners? You can plant St. Augustine and Centipede grasses together; however they do not coexist well. Centipede grass has a more robust root system and does not require the attention that St. Augustine does. In time, the Centipede grass will choke out the St. Augustine. Reduce the amount of water being applied to your St. Augustine lawn each week. Keep it moist under the thatch but not consistently wet. Stick as close as possible to 1 inch of water per week applied in a single, deep watering session. More frequent and ample watering will drive more dollar weed growth. Mow your St. Augustine lawn to its proper blade height for optimal health, which is between 1 and 3 inches. When growing St. Augustine in shade conditions, keep the grass at 3 inches for optimal performance. Spray young dollar weed plants in the spring and fall with an herbicide containing the active ingredient atrazine. Select a product designed for St. Augustine and/or centipede grasses. Apply according to product label directions and only use on established lawns that are in their active growth cycle. Soak the bare spots with water if they have occurred due to dog urine. Allow the spot to dry, and repeat the soaking process two more times. Water the planting area to a depth of 4 inches if you haven’t done so. Allow the soil to drain. Create holes that are 1 inch wider than the St. Augustinegrass plugs' rootballs. Place the plugs 12 to 18 inches apart. A bulb auger or dibble will help you easily create the holes. Add plug fertilizer to the holes according to the rate suggested on the fertilizer package for the size of the holes. Place the plugs into the holes, and pat soil around the roots. Water the St. Augustinegrass plugs just enough to moisten them, and then soak them everyday until they have covered the bare spot. Select a date to aerify St. Augustine grass while it is actively growing from April to September. Pick a day when the soil is moist but not damp and when the temperature is mild. Use a sod-coring tool to aerate small sections by hand. These are available in hardware stores or garden centers. Drive the tool into the soil and then pull it out. Leave the dropped cores on the St. Augustine grass to decompose naturally. Rent a motorized core aerator or aerifier from a garden center to aerate large areas of St. Augustine grass. Run the machine over the entire area in one direction and then go over the area again in a perpendicular direction. Do not remove the soil cores. St. Augustine dwarf varieties such as 'Delmar' and 'Amerishade' offer good shade tolerance. They do tend to build up a thick layer of thatch, however. 'DeltaShade' and 'Bitterblue' cultivars both make good choices for shady lawns. 'Seville' works well in both shade and full sun, making it an ideal choice for a lawn with widely varying degrees of light. Avoid growing certain types of St. Augustine grass that have a poor track record in shady conditions. 'Floratam' and 'Floralawn' both perform best in sunny locations. You may also want to avoid the 'Classic' cultivar, which claims good shade tolerance but remains untested by university research, according to the University of Florida Extension. Water St. Augustine grass sparingly during the spring. Irrigate newly-laid St. Augustine sod immediately after installation and several times a day, lightly, for the first 7 to 10 days. Water new sod or seed with 1/4 to 1/2 inch of water, once a day, for the next week. Begin this watering schedule once the grass' roots have established themselves. Irrigate the grass two to three times per week, with 1/4 to 1/2 inch of water, for the following three to four weeks. Water established lawns on an “as-needed” basis only, to promote a strong, healthy root system. The grass should receive 1 to 1 1/2 inch of water per week, including what it receives through rainfall. Mow wet grass with a freshly sharpened cutting blade, as sharp as possible so it will slice cleanly through the grass blade. Set the blade height as high at it will go; between 3 and 4 inches is best for St. Augustine grass. Set up the mower so that the clippings are expelled from the side of the mower over the area previously mowed. Disengage or remove any mulching attachment. Double mow the lawn twice to break up the mounds of wet clippings. Mowing again at the same or slightly lower height will further cut up the clippings and redistribute them over the lawn in finer cuttings, as mulch. Mow your existing lawn with your lawn mower to get it as short as possible. This helps the seeds get established and grow over the existing lawn. Fill in bare or low spots in your lawn with topsoil to even out the grade. If you don't have any dips in your lawn's grade, skip this step. Rake the top 1/4 inch of the soil with a small rake over any bare spots on your lawn. You do not need to rake the lawn in areas that have a healthy layer of grass growing. Scatter St. Augustine grass seed over your lawn by hand or using a mechanical spreader. Add 16 seeds per square inch, per Greenview Fertilizer's recommendation. Cover the grass seed with 1/4 inch of topsoil. Water the newly planted grass seed until the soil becomes moist but not sopping. Continue to keep the grass seed moist until it germinates. Bitter Blue St. Augustine grass has a dark blue-green foliage and a denser, finer texture than common St. Augustine grass. With improved shade and saline tolerance, Bitter Blue is also better adapted to wide temperature fluctuations. 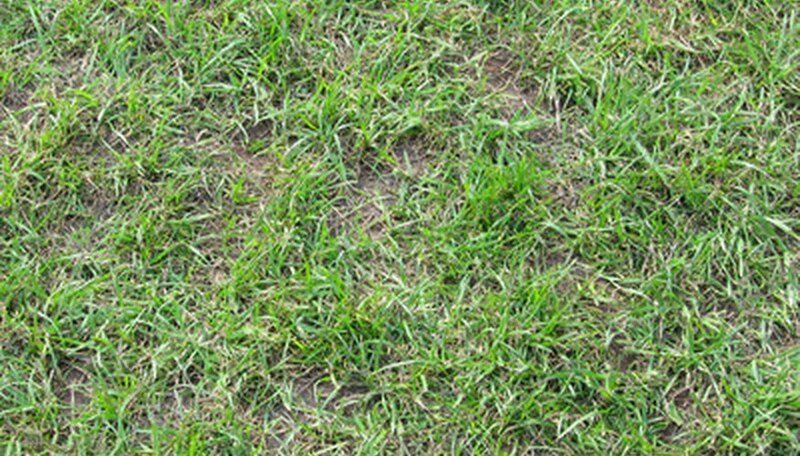 Bitter Blue grass should be maintained at a 3-4 inch height and is usually grown from seed because few Bitter Blue sod farms exist. Floratam St. Augustine grass is the best variety for shady, trafficked lawn areas. With less cold tolerance than common St. Augustine grass, Floratam has longer, wider blades that can grow up to 3/4 inch per day during the summer months. Floratam grass requires large amounts of direct sunlight and becomes dormant for a longer period during the winter months, when compared to other varieties. Palmetto St. Augustine grass has better color and is able to withstand cooler temperatures than common St. Augustine grass. Additionally, Palmetto has the best shade, heat and drought tolerance of all varieties. With a similar texture to Bitter Blue, Palmetto has fine, thin leaf blades that form a dense turfgrass. Raleigh St. Augustine grass is the least studied variety that is thought to be cold, drought and shade resistant. During peak summer temperatures Raleigh grass turns yellowish and growth diminishes. Raleigh prefers lower-pH, clay-based soils in northern Florida. St. Augustine grass (Stenotaphrum secundatum) produces above-ground runners called stolons, which allow it to reach new locations where it will put down roots. St. Augustine is a warm-season grass that is used for lawns. Inspect the color of the grass. Look for blades of grass that have a deep, blue-green hue. Study the structure of the leaf blades. Note that St. Augustine leaf blades are usually folded, are wide and coarse, have no auricles and are smooth and round at the tip, giving them a boatlike appearance. Examine the structure of the leaf sheath, which on St. Augustine grass is flattened. Look for stolons, which are generally compressed, not rhizomes. Inspect the ligules (the projection at the bottom of a leaf blade.) Look for a fringe of hairs to locate the ligules. Count the spikeletes, which will vary from 1 to 3 on the racemes. Study its growth habit, which is a creeping growth habit for St. Augustine grass. Decide on the length of your St. Augustine grass. You can mow this grass at varying lengths from 1 1/2 inches up to 3 inches. Base your decision on length on the amount of time you want to spend taking care of the lawn. Cut grass 3 inches high every two weeks; cut 2 1/2 inch length every week to 10 days; and mow a lawn 2 inches or less every five days. Adjust the blade height of the mower to the length you have decided on. If you have a mostly shady lawn, choose 3 inches. Cut grass 1 inch higher in the fall. Raise the blade on the mower to adjust for this. Mow less often in the fall, as the grass grows more slowly. How Often Should You Water St. Augustine Grass?